There are few places on the planet where the simple act of waiting for a light to change is elevated to such beauty and grace. Even with a stiff wind blowing in from Sweden. Up over Knippels Bridge like millions and millions of cyclists before her since the 1930's. Not much rush in this hour. Nice and easy. Copenhagen style. 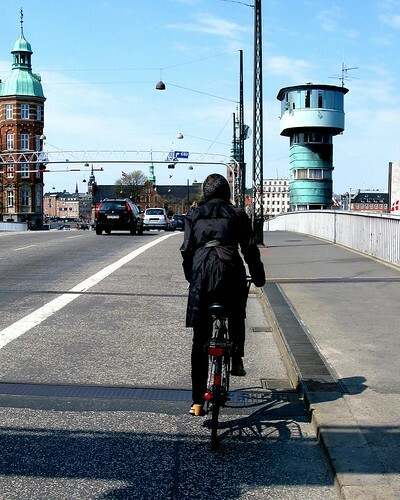 Congratulations Copenhagen, for your VERY ACTIVE active transportation habits, and for a stylish, relaxed and laid back attitude towards functional cycling. I have just started an Eco-Taxi Pedicab business in Winnipeg, Canada, in the middle of North America. I really live and model laid back cycling, as I cycle year round an a semi-recumbent bike... so I plough through the snow and ice literally "laid back!!!" We have less than 4% active cycling in our city, but we just had an amazing presentation from a cycling advocate from Bogota Columbia, and he cited Copenhagen as having made fantastic improvements in the cycling climate. You are a mentor for us North American cycling advocates. We like your style and your approach... We will post some of our successes as we continue to admire some of YOUR successes! Your bike lanes look like Shangri-La compared to the facilities we have. But we are very FLAT and windy, and we have more railways tracks and rivers than just about any city in North America, so the potential for commuter and recreational cycling and bike paths is enormous! How about cycling outside of Copenhagen. Is it as popular as the capital city? How flat is Copenhagen? I live in Seattle- where the Ice Age left behind hills that make impossible to WALK in the heels you Danish ride in. @ecorider: Keep up the good (and laid back) work! We're more than happy to provide inspiration. @bluefish: Cycling in Denmark is widespread and still increasing in Denmark's other major cities such as Århus, Odense and Ålborg. In the countryside however, there is a decrease in cycling. @Sean Kelly: It's much easier to ride a bike in high heels than to walk with them. I speak from experience! Thanks from me, too! As Marie pointed out, we have a blogpost about these strange flat myths. Seattle is a pancake compared to Berne and Basel in Switerland and these two cities have 25%+ bike usage. 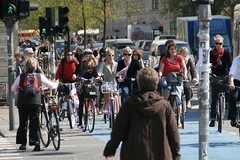 And all on the same kind of bikes that we use in Copenhagen. So hills are no excuse. The link Marie added IS HERE. "Debunking the Flat Country=Bike Country Myth"